Mufti equated the PDP-BJP coalition with "bringing together of North Pole with South Pole". The BJP had reasons for pursuing an alliance with the PDP that had nothing to do with conspiracies to ‘saffronise’ the Valley. Prime Minister Narendra Modi will attend the swearing in of the PDP-BJP government led by Mufti Mohammad Sayeed in Jammu on Sunday. Asked what transpired at the meeting, Mufti did not elaborate but quoted an Arabic proverb “Al haq u murrun walaw kaana durrun”, saying it means “truth is bitter, even if it is an invaluable pearl”. He said that the first and foremost concern was peace and then development. “These two are intertwined,’’ he said. “And our discussion revolved around this subject only. We want peace and create an atmosphere for development. For this (peace), we will have to address the political issues. We also discussed how to provide a stable government to the state,’’ he said. He said he did talk to Modi on economic issues because “toumle boh-re kun te chu khayal thavun pevaan” which in Kashmiri means “we have to keep the rice bag in mind”. “I am very positive. I am hopeful that I will make a difference in the lives of our people,’’ he said. “You have every right to be critical of this alliance – we will tolerate criticism. But I am sure people will appreciate our efforts once things start to shape up”. Mufti was accompanied by Haseeb Drabu, who was negotiating the power-sharing deal with the BJP on behalf of the PDP and authored the framework for the coalition government called “Agenda of Alliance”. Mufti had a one-on-one with Modi and then Drabu was asked to join the discussion. After sorting out last-minute hitches in the alliance document late Wednesday night, Drabu, who is tipped to be the state finance minister with charge of one more important ministry, flew to Jammu on Thursday morning and returned to Delhi with Mufti for the meeting with the Prime Minister. Sources said Mufti wanted to meet Modi only after “a complete consensus was achieved” between the alliance partners. And when he met Modi, it was a “picture perfect moment” where Modi gave Mufti a hug while both were all smiles. The coalition government, sources said, will have 12 cabinet rank ministers in a 24-member council of ministers, which would be equally divided between the two parties. While Mufti would be chief minister for the entire six-year tenure, BJP’s Nirmal Singh is likely to be the deputy chief minister. The two parties are also going to share the post of the assembly speaker and legislative council chairman. Apart from the give-and-take on contentious political issues, the Agenda for Alliance, sources said, includes an economic revival plan for the state. There is a package on power that includes return of Uri and Dulhasti power projects to the state government; a thermal power project and a coal block in Madhya Pradesh. It also talks about construction of three important tunnels along the Srinagar-Leh highway (Zojila), Mughal road and the road connecting Kashmir valley with Chenab valley. There is also talk about a road connecting Suru valley in Ladakh with Pahalgam in south Kashmir as well as few other important road links in the Chenab valley. Sources said the document also talks about establishment of tourist circuits and IT parks. There is emphasis on industry in Jammu and on horticulture in Kashmir. There is also an elaborate plan for water body conservation, sources said. The document includes a programme for “revival of Jhelum and Doodh Ganga”. The coalition government, sources said, promises a plan for heritage conservation in Srinagar city and “smart cities” for both Srinagar and Jammu, which are the summer and winter capitals of the state respectively. There is also a plan for relief and rehabilitation of Kashmiri Pandits. Sources said that unlike the earlier plans, the focus of this government will be on “reintegrating Kashmiri Pandits into Kashmiri society by encouraging their return to their ancestral homes across Kashmir”. 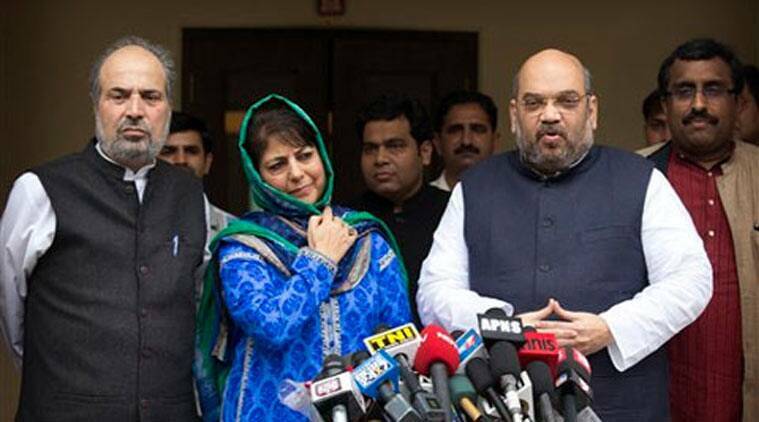 The PDP-BJP coalition was negotiated because of a fractured verdict in the assembly polls. While PDP was the largest party with 28 seats in the 87-member house, the BJP won 25. NC 15 and Congress 12. The Sajjad Lone-led Peoples Conference won two seats.